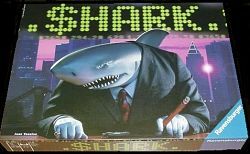 Shark is a stock-trading game where plays on the game board determine the share values of the various companies. Each player may buy (maximum 5 shares total during their turn) and sell (unlimited) shares both before and after their turn. During their turn they roll dice to determine which company they can affect and in what region thye can place that company's marker. Placing next to another of that company's markers increases the company's share price, which pays out in two ways: first, for placing the marker and secondly, all players get paid the amount of the increase, multiplied by the number of shares each of them owns. This wealth is not without risks, though, as placing in a way that brings two companies' marker-groups adjacent to each other causes the smaller group to be removed from the board, decreasing that company's share price accordingly -- and all players must pay the amount of the decrease, again multiplied by the number of shares they hold in that company! The game ends if all of one company's markers have been used, if one company's share price reaches 15, or all of shares in the game are sold; at which time the players cash out their stock and determine who, with the most money, has won.